In case of heterogeneous material like concrete or mortar, there have also another consideration of zone that remains between cementing medium and aggregate. This zone is interfacial transition zone which lies between cement paste and aggregate not between fine aggregate and cement paste. ACI code specifies maximum size of coarse aggregate which are not discussing here. Maximum size of aggregate influence interfacial transition zone and also microcracks remains in this zone. In our previous post we have discussed how is permeability associated to cracking in this zone? In cement paste the interfacial transition zone is absent thus reducing microcracks. The differential strain is also less as homogeneous consistency remains in this system. The absence of cracks more accurately less cracks in cement paste makes them more resistant to permeability. 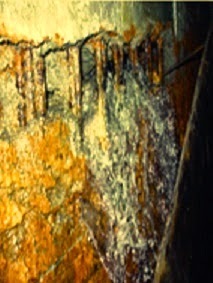 In case of concrete or mortar, the microcracks are generated due to shrinkage cracks within interfacial transition zone; while interfacial transition zone is weak in early period of hydration which ultimately interconnected to form a continuity to make water to flow thus increasing permeability. The permeability of aggregate also have influence on permeability of concrete, the co-efficient of permeability of different aggregate and their influence on concrete permeability will be discussed in our next post.